When entrenched in our daily routines, we do not often think about the sacrifices made that afford us the liberties we enjoy. There are holidays that provide time for reflection – a time to honor the men and women of the United States armed forces. It takes more, however, than a pause or a thought to thank our soldiers. 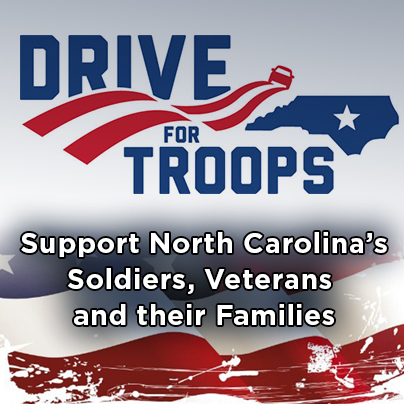 That’s why all of Leith’s dealership have joined with the North Carolina Automobile Dealers Association to raise funds in a Drive for Troops campaign. A donation will be made from the proceeds of every single vehicle, new or used, sold between Memorial Day and Labor Day. This is an opportunity to do more than passively thank our military – you can make a difference for them. If you’re not in the market for a vehicle, you can still donate to the cause by following this direct link. In 2004, the NCADA raised more than $250,000 for the program; we can do more. There are various charitable organizations that will benefit from the proceeds: Patriot Scholarships, Operation Homefront, Marine Corps. Scholarship Foundation, Hiring Our Heroes, and Fisher House. These organizations help veterans and their families in various ways, including educational support, employment support, and much more. There are five military bases, a Coast Guard base, and a military ocean terminal in NC. NC has the ninth largest population of military veterans – nearly 800,000. More than one-third of NC’s population is either on active duty, is a veteran, or has an immediate family member who is active duty or a veteran. Many military personnel and veterans suffer from physical and mental health issues that have compounded financial hardships – and they need our help. We hope that you’ll join us in actively honoring these selfless, brave members of our fighting forces.